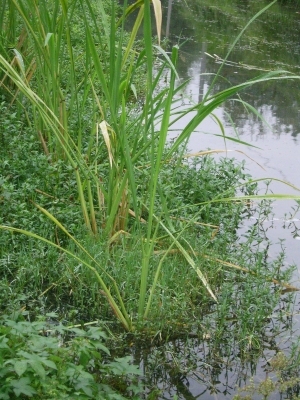 An interesting article on growing wild rice, Zizania aquatica and Z. latifolia. E. Asia - China, Japan, Manchuria. ]. Store collected seed in jars of water in a cool place such as the salad compartment of a fridge. Sow the seed in a greenhouse in spring. Immerse the pots so that they are covered by about 5cm of water. When they are large enough to handle, prick the seedlings out into individual pots and grow them on in the greenhouse for their first winter. Plant them out into their permanent positions in late spring or early summer, after the last expected frosts. Division in spring. Larger divisions can be planted out direct into their permanent positions. We have found that it is best to pot up smaller divisions and grow them on in light shade in a greenhouse or cold frame until they are growing away well. Plant them out in the summer or the following spring.